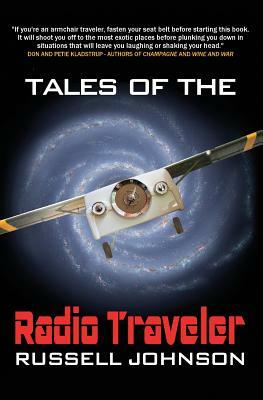 Russell Johnson tunes into the wavelengths of the world as he blends radio lore, science, and wry, sometimes irreverent humor in his travel adventures in 18 countries. As a child growing up in Midwestern America, radio was his window on the world and the universe. Hearing the faint radio beeps of Sputnik passing overhead, the oily propagandists of Radio Moscow, a ham radio operator in Borneo, the million watt voices of preachers and hucksters, and Wolfman Jack howling at America from across the Mexican border demonstrated that there was a world far beyond his neighborhood - even the grip of gravity - a world he wanted to see for himself. The story begins at the beginning of his own radio career, under a radio tower in a Minnesota swamp on the first day of duck hunting season, ventures out through the jungles of Nepal in pursuit of the mother of all chickens, and to the Fiji islands where he broadcasts a coup d'etat. He travels to South Korea where he helps its president save face, to Sri Lanka to watch Arthur C. Clarke redesign Mars, Munich where he joins a flea circus, and California's far north where radio telescopes and crystal gazers seek signs of alien life. On a more serious note, he also examines the impacts of tourism on cultures and environments, painfully watching the destruction of Southeast Asian rain forests over the many times he has flown over them, and the over development of Bali since he attended the wedding of a prince there in 1992.